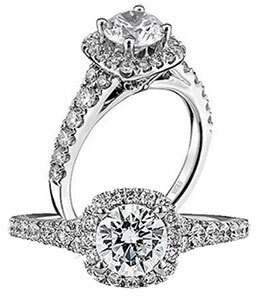 Getting engaged and planning a life together with that special someone is an enthralling time that deserves an enchanting engagement ring from Scott Kay Bridal. The design team creates 14kt and 18kt white gold and platinum rings of timeless beauty to last a lifetime and beyond; future family heirlooms with the most sought-after, romantic, pure and precious of gemstones – the diamond. Each and every hand-sculpted Scott Kay diamond engagement ring sets a trend in bridal jewelry, whether a solitaire mounting, or classic four-prong setting, crown setting, filigree setting or halo setting. You’ll fall in love with the fluid lines and luxurious styling found in any number of elegant and expressive Scott Kay engagement mountings. A varied collection includes the Crown, Heaven’s Gate, Luminaire, Radiance and Tiara collections. An engagement ring from Scott Kay is classic and innovative, impressive and versatile, offering uncompromising beauty and quality.